Calling yogis of all levels! Whether you’re an experienced yogi, beginner, athlete, male, or mother-to-be, we’ve rounded up a list of different yoga studios for you to try. If you’re looking for a way to spice up your fitness routine or simply looking for a way to feel more at peace, yoga might be your thing! Keep reading for your guide to the yoga studios along our beautiful Emerald Coast. You might be familiar with Hot Yoga Om as its located right on the strip in Downtown Fort Walton Beach. This is the only hot yoga studio I have personally practiced at and I loved it. It’s incredibly simple to book a class and the instructors have always been extremely welcoming. Dragonfly is very close to Hot Yoga Om in Downtown Fort Walton Beach. The class I took here was a bit more relaxed and calm than the hot yoga classes I have taken, but it was still challenging! The instructor was so warm hearted and welcoming. The class size was smaller so she was even able to give me some pointers to improve my downward dog. While Studio Fit isn’t a dedicated yoga facility, they do offer a yoga class three times a week, along with a few other classes, including Zumba, R.I.P.P.E.D, and Total Body Circuit. Another awesome aspect of Studio Fit is that they have childcare during their group fitness classes and their prices are extremely affordable! Yoga Junkie is Niceville’s only Hot Yoga studio. They offer a variety of classes including hot yoga, pre and post natal yoga, adaptive yoga with chairs, Buti yoga, and so much more! Sunshine Yoga Studio offers a variety of both heated and unheated classes. They even offer a once per month Tiny Tots Yoga. For only $15, you and your tot (ages 2-4) can enjoy a playful class together. What a wonderful way to lead by example! 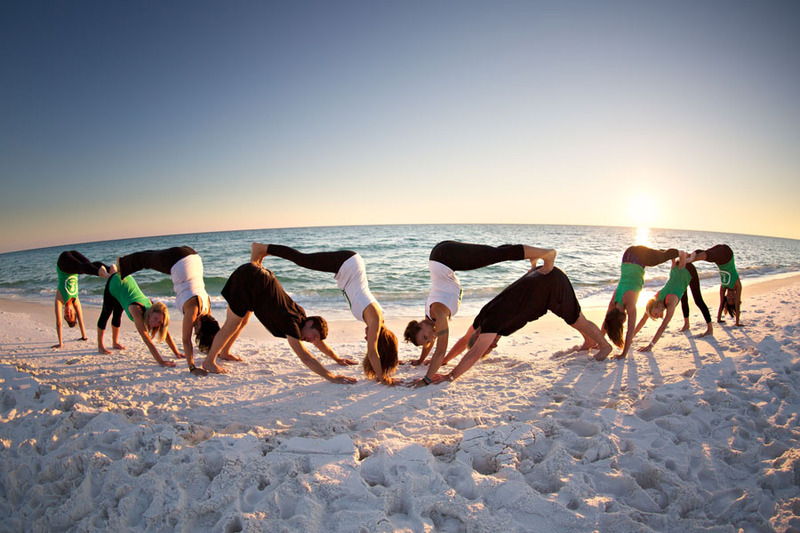 Destin Beach Yoga has been in the practice for 15 years! Most of the classes meet at James Lee Public Park (by the Crab Trap in Destin) and the cost is only $10 for a drop in. They have yoga mats for borrow and also offer some classes at local gyms. You can find the full schedule on their website. 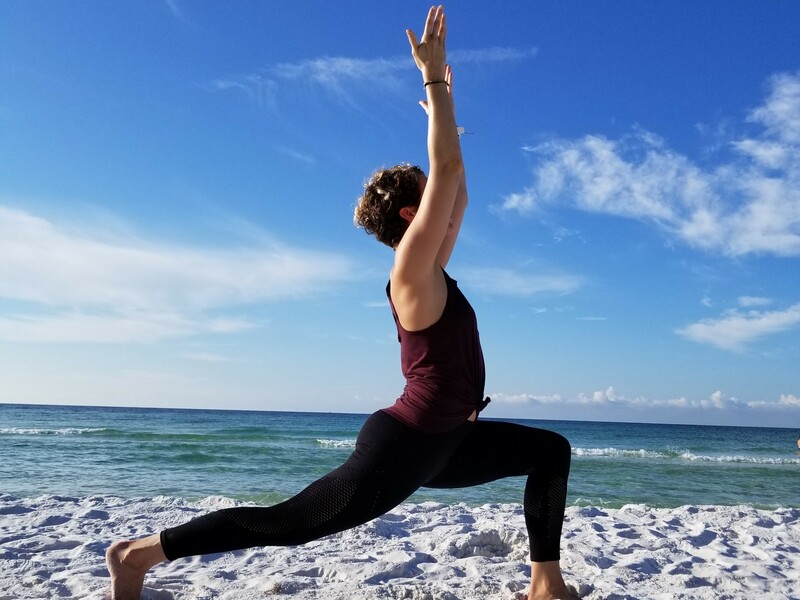 Destin Hot Yoga welcomes yogis of all levels and while most of their classes are heated, they have quite a few unheated classes on the schedule! Don’t have your own yoga mat? They have them available to rent for $2 per class. Additionally, if becoming a yoga instructor interests you, they offer yoga teacher training. If you’re a beginner and located in Navarre, ElemenTree might be a wonderful option for you to try out. While they have a variety of classes, including restorative yoga, playful flow, and fierce flow, they also offer Yoga for Beginner classes! They also offer the ability to book a massage therapist, one of which incorporates Reiki into her massages. How lucky are we to have these amazing yoga studios to choose from? Many of these studios also have workshops and events they offer outside of normal class times, so keep an eye on their Facebook pages and websites if you want to dive deeper into yoga. Are you a yogi? If so, which studio do you practice at? Let us know! Not a yogi? Check out our five other fun ways to workout. Featured image graciously contributed by local yoga instuctor, Kaitlin Fair.